Preventing Changes to BIOS Settings — If an intruder has access to the BIOS, they can set it to boot from a CD-ROM or a flash drive. This makes it possible for an intruder to enter rescue mode or single user mode, which in turn allows them to start arbitrary processes on the system or copy sensitive data. For instructions on password protecting BIOS-like programs on other architectures, see the manufacturer's instructions. Protecting access to single user mode with a password by editing the SINGLE parameter in the /etc/sysconfig/init file is not recommended. An attacker can bypass the password by specifying a custom initial command (using the init= parameter) on the kernel command line in GRUB. It is recommended to password-protect the GRUB boot loader as specified in Section 2.1.2.2.1, “Password Protecting GRUB”. Red Hat Enterprise Linux 6 includes the GRUB boot loader on the x86 platform. For a detailed look at GRUB, see the Red Hat Enterprise Linux Installation Guide. If shadow passwords are deselected during installation, all passwords are stored as a one-way hash in the world-readable /etc/passwd file, which makes the system vulnerable to offline password cracking attacks. If an intruder can gain access to the machine as a regular user, he can copy the /etc/passwd file to his own machine and run any number of password cracking programs against it. If there is an insecure password in the file, it is only a matter of time before the password attacker discovers it. This forces a potential attacker to attempt password cracking remotely by logging into a network service on the machine, such as SSH or FTP. This sort of brute-force attack is much slower and leaves an obvious trail as hundreds of failed login attempts are written to system files. Of course, if the attacker starts an attack in the middle of the night on a system with weak passwords, the cracker may have gained access before dawn and edited the log files to cover his tracks. To protect the network from intrusion it is a good idea for system administrators to verify that the passwords used within an organization are strong ones. When users are asked to create or change passwords, they can use the command line application passwd, which is Pluggable Authentication Modules (PAM) aware and therefore checks to see if the password is too short or otherwise easy to crack. This check is performed using the pam_cracklib.so PAM module. In Red Hat Enterprise Linux, the pam_cracklib PAM module can be used to check a password's strength against a set of rules. It can be stacked alongside other PAM modules in the password component of the/etc/pam.d/passwd file to configure a custom set of rules for user login. The pam_cracklib's routine consists of two parts: it checks whether the password provided is found in a dictionary, and, if that is not the case, it continues with a number of additional checks. For a complete list of these checks, see the pam_cracklib(8) manual page. 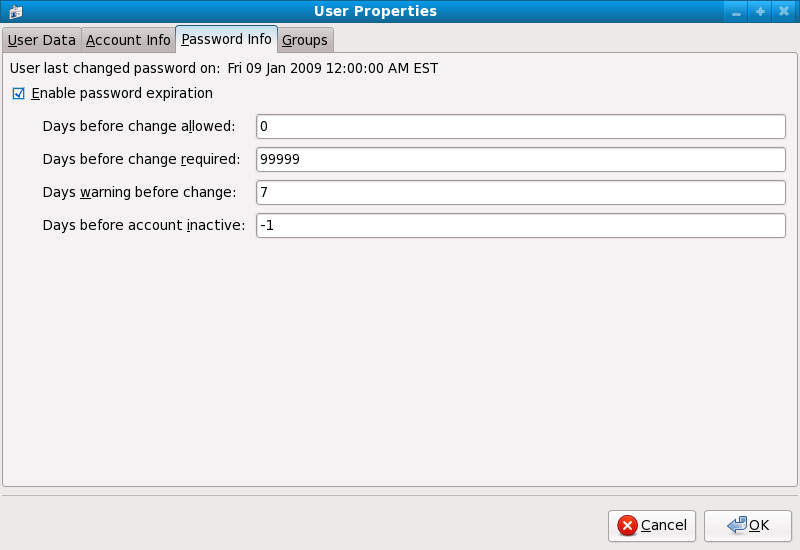 In this example, the password entered cannot contain more than 3 consecutive characters, such as "abcd" or "1234". Additionally, the number of identical consecutive characters is limited to 3. As these checks are not performed for the root user, he can set any password for a regular user, despite the warning messages. Since PAM is customizable, it is possible to add more password integrity checkers, such as pam_passwdqc (available from http://www.openwall.com/passwdqc/) or to write a new module. For a list of available PAM modules, see http://uw714doc.sco.com/en/SEC_pam/pam-6.html. For more information about PAM, see the Managing Single Sign-On and Smart Cards guide. John The Ripper — A fast and flexible password cracking program. It allows the use of multiple word lists and is capable of brute-force password cracking. It is available online at http://www.openwall.com/john/. Crack — Perhaps the most well known password cracking software, Crack is also very fast, though not as easy to use as John The Ripper. Slurpie — Slurpie is similar to John The Ripper and Crack, but it is designed to run on multiple computers simultaneously, creating a distributed password cracking attack. It can be found along with a number of other distributed attack security evaluation tools online at http://www.ussrback.com/distributed.htm. Passphrases and passwords are the cornerstone to security in most of today's systems. Unfortunately, techniques such as biometrics and two-factor authentication have not yet become mainstream in many systems. If passwords are going to be used to secure a system, then the use of passphrases should be considered. Passphrases are longer than passwords and provide better protection than a password even when implemented with non-standard characters such as numbers and symbols. Shadow passwords must be enabled to use the chage command. For more information, see the Red Hat Enterprise Linux 6 Deployment Guide. Using a null password, while convenient, is a highly insecure practice, as any third party can log in first and access the system using the insecure user name. Always make sure that the user is ready to log in before unlocking an account with a null password. Note that for other desktop environments, the respective files of those environments should be edited. The pam_access PAM module allows an administrator to customize access control based on login names, host or domain names, or IP addresses. By default, the module reads the access rules from the /etc/security/access.conf file if no other is specified. For a complete description of the format of these rules, see the access.conf(5) manual page. By default, in Red Hat Enterprise Linux, pam_access is included in the /etc/pam.d/crond and /etc/pam.d/atd files. In order to limit access from other services, the pam_access module should be required in the respective file in the /etc/pam.d directory. Alternatively, you can enable the pam_access module using the Authentication Configuration utility. To start this utility, select System → Administration → Authentication from the top menu. From the Advanced Options tab, check the "enable local access control option". This will add the pam_access module to the systemwide PAM configuration. The pam_time PAM module is used to restrict access during a certain time of the day. It can also be configured to control access based on specific days of a week, user name, usage of a system service, and more. By default, the module reads the access rules from the /etc/security/time.conf file. For a complete description of the format of these rules, see the time.conf(5) manual page. For these configurations to be applied to the desktop environment, the pam_time module should be included in the corresponding files in the /etc/pam.d directory. and specify priority to be set by the nice utility. The following line should be present by default in /etc/pam.d/system-auth. If not, add it manually. For the system administrators of an organization, however, choices must be made as to how much administrative access users within the organization should have to their machine. Through a PAM module called pam_console.so, some activities normally reserved only for the root user, such as rebooting and mounting removable media are allowed for the first user that logs in at the physical console (see Managing Single Sign-On and Smart Cards for more information about the pam_console.so module.) However, other important system administration tasks, such as altering network settings, configuring a new mouse, or mounting network devices, are not possible without administrative privileges. As a result, system administrators must decide how much access the users on their network should receive. Running Insecure Services — Users with root access might run insecure servers on their machine, such as FTP or Telnet, potentially putting user names and passwords at risk. These services transmit this information over the network in plain text. Keeping the audit trail intact — Because the root account is often shared by multiple users, so that multiple system administrators can maintain the system, it is impossible to figure out which of those users was root at a given time. When using separate logins, the account a user logs in with, as well as a unique number for session tracking purposes, is put into the task structure, which is inherited by every process that the user starts. When using concurrent logins, the unique number can be used to trace actions to specific logins. When an action generates an audit event, it is recorded with the login account and the session associated with that unique number. Use the aulast command to view these logins and sessions. The --proof option of the aulast command can be used suggest a specific ausearch query to isolate auditable events generated by a particular session. To further limit access to the root account, administrators can disable root logins at the console by editing the /etc/securetty file. This file lists all devices the root user is allowed to log into. If the file does not exist at all, the root user can log in through any communication device on the system, whether through the console or a raw network interface. This is dangerous, because a user can log in to their machine as root through Telnet, which transmits the password in plain text over the network. For more information about PAM, see the chapter titled Using Pluggable Authentication Modules (PAM) in the Red Hat Enterprise Linux Managing Single Sign-On and Smart Cards guide. For more information on how to install packages in Red Hat Enterprise Linux, see the Installing Packages section in the Red Hat Enterprise Linux 6 Deployment Guide. Rather than completely denying access to the root user, the administrator may want to allow access only by setuid programs, such as su or sudo. For more information on su and sudo, see the Red Hat Enterprise Linux 6 Deployment Guide and the su(1) and sudo(8) man pages. In Red Hat Enterprise Linux 6, the pam_faillock PAM module allows system administrators to lock out user accounts after a specified number of failed attempts. Limiting user login attempts serves mainly as a security measure that aims to prevent possible brute force attacks targeted to obtain a user's account password. To prevent the system from locking users out even after multiple failed logins, add the following line just above the line where pam_faillock is called for the first time in both /etc/pam.d/system-auth and /etc/pam.d/password-auth. Also replace user1, user2, user3 with the actual user names. For more information on various pam_faillock configuration options, see the pam_faillock(8) man page. Users may need to leave their workstation unattended for a number of reasons during everyday operation. This could present an opportunity for an attacker to physically access the machine, especially in environments with insufficient physical security measures (see Section 1.1.3.1, “Physical Controls”). Laptops are especially exposed since their mobility interferes with physical security. You can alleviate these risks by using session locking features which prevent access to the system until a correct password is entered. Press the key combination specified in System → Preferences → Keyboard Shortcuts → Desktop → Lock screen. The default combination is Ctrl+Alt+L. Select System → Lock screen on the panel. All of the techniques described have the same result: the screen saver is activated and the screen is locked. Users can then press any key to deactivate the screen saver, enter their password and continue working. If the gnome-screensaver process is currently running, a number denoting its identification number (PID) will be displayed on the screen after executing the command. If the process is not currently running, the command will provide no output at all. Refer to the gnome-screensaver-command(1) man page for additional information. The means of locking the screen described above rely on manual activation. Administrators should therefore advise their users to lock their computers every time they leave them unattended, even if only for a short period of time. As the name gnome-screensaver-command suggests, the locking functionality is tied to GNOME's screen saver. It is possible to tie the lock to the screen saver's activation, locking the workstation every time it is left unattended for a set period of time. This function is activated by default with a five minute timeout. To change the automatic locking settings, select System → Preferences → Screensaver on the main panel. This opens a window which allows setting the timeout period (the Regard the computer as idle after slider) and activating or deactivating the automatic lock (the Lock screen when screensaver is active check box). 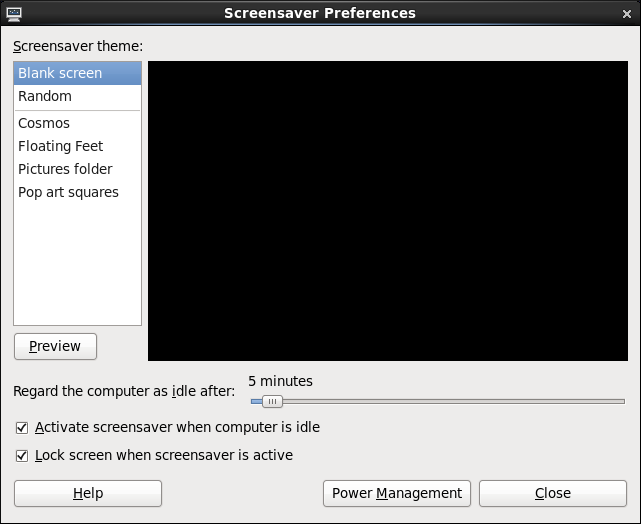 Disabling the Activate screensaver when computer is idle option in the Screensaver Preferences dialog prevents the screen saver from starting automatically. Automatic locking is therefore disabled as well, but it is still possible to lock the workstation manually using the techniques described in Section 2.1.10.1, “Locking GNOME Using gnome-screensaver-command”. Replace <username> with your user name and <server> with the IP address of the workstation you want to lock. Refer to Section 3.2.2, “Secure Shell” for more information regarding ssh. Refer to the vlock(1) man page for additional information. The program does not currently allow unlocking consoles using the root password. Additional information can be found in BZ#895066. Locking a console does not clear the screen and scrollback buffer, allowing anyone with physical access to the workstation to view previously issued commands and any output displayed in the console. Refer to BZ#807369 for more information. Many services under Red Hat Enterprise Linux 6 behave as network servers. If a network service is running on a machine, then a server application (called a daemon), is listening for connections on one or more network ports. Each of these servers should be treated as a potential avenue of attack. Script Vulnerability Attacks — If a server is using scripts to execute server-side actions, as Web servers commonly do, an attacker can attack improperly written scripts. These script vulnerability attacks can lead to a buffer overflow condition or allow the attacker to alter files on the system. Buffer Overflow Attacks — Services that connect to ports numbered 0 through 1023 must run as an administrative user. If the application has an exploitable buffer overflow, an attacker could gain access to the system as the user running the daemon. Because exploitable buffer overflows exist, attackers use automated tools to identify systems with vulnerabilities, and once they have gained access, they use automated rootkits to maintain their access to the system. Execshield also includes support for No eXecute (NX) technology on AMD64 platforms and eXecute Disable (XD) technology on Itanium and Intel® 64 systems. These technologies work in conjunction with ExecShield to prevent malicious code from running in the executable portion of virtual memory with a granularity of 4KB of executable code, lowering the risk of attack from buffer overflow exploits. To limit exposure to attacks over the network, disable all services that are unused. When determining whether to leave these services running, it is best to use common sense and avoid taking any risks. For example, if a printer is not available, do not leave cupsd running. The same is true for portmap. If you do not mount NFSv3 volumes or use NIS (the ypbind service), then portmap should be disabled. If unsure of the purpose for a particular service, the Services Configuration Tool has a description field, illustrated in Figure 2.3, “Services Configuration Tool”, that provides additional information. Checking which network services are available to start at boot time is not sufficient. It is recommended to also check which ports are open and listening. Refer to Section 2.2.9, “Verifying Which Ports Are Listening” for more information. Potentially, any network service is insecure. This is why turning off unused services is so important. Exploits for services are routinely revealed and patched, making it very important to regularly update packages associated with any network service. Refer to Section 1.5, “Security Updates” for more information. All remote login and shell programs (rlogin, rsh, and telnet) should be avoided in favor of SSH. Refer to Section 2.1.13, “Security Enhanced Communication Tools” for more information about sshd. FTP is not as inherently dangerous to the security of the system as remote shells, but FTP servers must be carefully configured and monitored to avoid problems. Refer to Section 2.2.6, “Securing FTP” for more information about securing FTP servers. More information on securing network services is available in Section 2.2, “Server Security”. Configure the necessary services and implement a firewall before connecting to the Internet or any other network that you do not trust. Firewalls prevent network packets from accessing the system's network interface. If a request is made to a port that is blocked by a firewall, the request is ignored. If a service is listening on one of these blocked ports, it does not receive the packets and is effectively disabled. For this reason, ensure that you block access to ports not in use when configuring a firewall, while not blocking access to ports used by configured services. For most users, the best tool for configuring a simple firewall is the graphical firewall configuration tool which includes Red Hat Enterprise Linux: the Firewall Configuration Tool (system-config-firewall). This tool creates broad iptables rules for a general-purpose firewall using a control panel interface. Refer to Section 2.8.2, “Basic Firewall Configuration” for more information about using this application and its available options. For advanced users and server administrators, manually configuring a firewall with iptables is preferable. Refer to Section 2.8, “Firewalls” for more information. Refer to Section 2.8.9, “IPTables” for a comprehensive guide to the iptables command. Red Hat Enterprise Linux 6 includes two basic tools that use high-level, public-key-cryptography-based encryption algorithms to protect information as it travels over the network. Refer to Section 3.2.2, “Secure Shell” for more information regarding OpenSSH. Although the sshd service is inherently secure, the service must be kept up-to-date to prevent security threats. Refer to Section 1.5, “Security Updates” for more information. To enforce read-only mounting of removable media (such as USB flash disks), the administrator can use a udev rule to detect removable media and configure them to be mounted read-only using the blockdev utility. Starting with Red Hat Enterprise Linux 6.7, a special parameter can be also passed to the udisks disk manager to force read-only mounting of file systems. While the udev rule that triggers the blockdev utility is sufficient for enforcing read-only mounting of physical media, the udisks parameter can be used to enforce read-only mounting of filesystems on read-write mounted media. Note that a default 80-udisks.rules file is installed with the udisks package in the /lib/udev/rules.d/ directory. This file contains the above rules, but they are commented out. The above udev rules instruct the udisks disk manager to only allow read-only mounting of file systems. Also, the noexec parameter forbids direct execution of any binaries on the mounted file systems. This policy is enforced regardless of the way the actual physical device is mounted. That is, file systems are mounted read-only even on read-write mounted devices.